Sicily is the largest island in the Mediterranean and much bigger than most people realise. The Mafia and Inspector Montalbano spring to mind, whilst you’re unlikely to spot either of these, a visit to Sicily is rewarded with stunning architecture and traditions from 2,500 years of mixed Spanish, Roman, Greek, African and Italian occupation. If you’re expecting something much the same as Italy you’ll be disappointed, if you’re looking for surprises Sicily will deliver. Our tour covers the whole island and throughout you’re never far from the sea. We stay in the islands two major cities, capital Palermo and second city Catania; see the geographical phenomenon of Mount Etna, Europe’s most active volcano; the nature of San Vito lo Capo peninsular, the ancient monuments at the Valley of Temples and Salinunte, the wonderful architecture in Syracuse and Cefalù, the UNESCO towns of Noto and Taormina, and the amazing mosaics of Villa Romana. 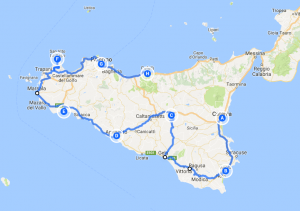 Add to this rich local cuisine, great wines, an opportunity to travel in your own motorhome with like minded people and this tour has all the content of a great holiday. ‘The tour was a real eye-opener to travellers who thought they knew Italy. Very different culture from the mainland with really good local food and wine. Many superb historical sites. Nurcan & Kevin were excellent leaders, again with a very good knowledge of the island. A thoroughly good tour from beginning to end. We meet in Paestum, southern Italy. 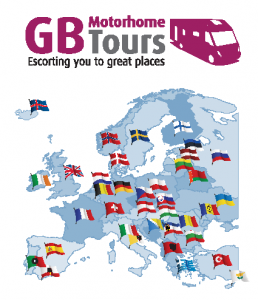 This evening we get together at the Tour Directors motorhome for welcome drinks and a tour briefing following which we move to the campsite bar for a taste of wood fired pizza and local wine. Ancient Paestum was a Greek city on the coast of the Tyrrhenian Sea where today three Greek temples of the Doric order remain, these give a taste for some of the great architecture to come once in Sicily. A free day. Located in the shadow of Mount Etna Catania, the islands second largest city, has been reshaped many times. Over the years following violent eruptions from its near neighbour, the city has been rebuilt seven times and the local’s response has always been to build using material that comes in abundance following volcanic activity – lava. This makes for an unusual and interesting architecture style and from our campsite there is easy public transport links to the city centre. 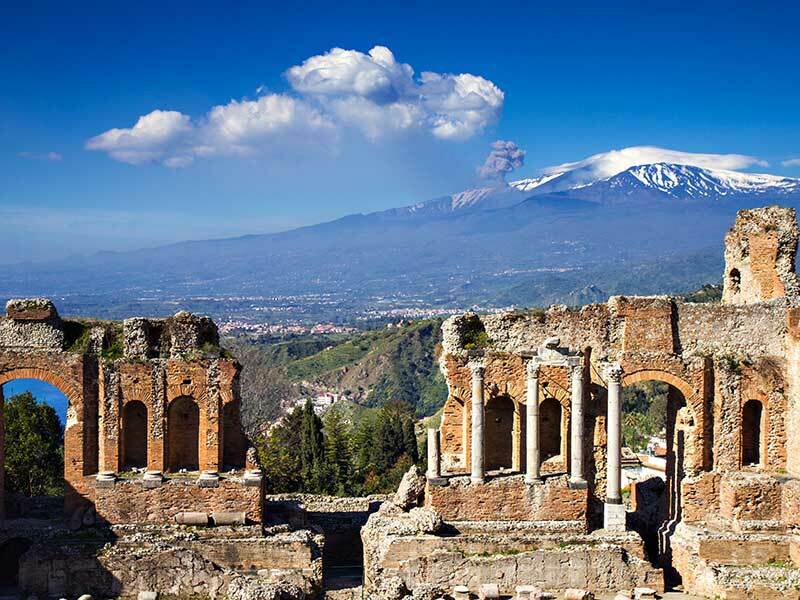 We have a guided excursion to Taormina and Mount Etna today. The beautiful town of Taormina is one of Sicily’s most famous resorts, perched on a rocky promontory overlooking the sea with dramatic views of Mount Etna it certainly justifies its nickname ‘the Pearl of the Mediterranean’. From Taormina we drive through Mount Etna’s national park to reach the highest point for vehicles where we take lunch in a mountain trattoria. Etna is one of the most active volcanos in the world and has been erupting for several millions of years; it was the legendary home of the Roman fire god, Vulcan, and the mythological one-eyed Cyclops. This afternoon there will be time to reach the summit by cable car & jeep for those who wish (payable locally). Free day. You may choose to relax at the campsite, swim in the sea or take a walk along the coast. A free day, our campsite is right to the beach. A full-day guided excursion to Noto and Syracuse. Noto is an attractive little town full of gold-coloured stone buildings with fantastical facades and despite being small achieves UNESCO world heritage status. Syracuse on the other hand is much bigger, has a magnificent archaeological zone and a beautiful centre built on the island of Ortigia. We have lunch included in a local restaurant. We visit the site of Sicily’s finest Roman remains, the Villa Romana del Casale, which was built between 310 and 340AD. This UNESCO World Heritage site is famous for the richness and quality of the mosaics that decorate almost every room, regarded as the finest in situ anywhere in the Roman world. We have breakfast prepared for us this morning on the terrace overlooking the vines of our Agriturismo followed by the remainder of the day to relax and do very little in beautiful rural surroundings, it is Sunday! A free day. The seafront is within walking distance of our campsite. A guided excursion in the extraordinary Valley of the Temples. This UNESCO World Heritage site is one of Europe’s most significant legacies of Ancient Greece. You will see the ruins of the many temples, necropolis, houses and streets. There is also a fine archaeological museum. A free morning. At lunch time we wander to the coast for a long leisurely lunch. A free day and opportunity to visit the ancient site of Salinunte. A free day, our campsite is located on the picturesque peninsular of San Vito lo Capo. An excursion today to ‘Riserva naturale dello Zingaro’ nature reserve with lunch in a local restaurant included. A free day. San Vito town with its picturesque harbour and beach is just 15 minute walk away. A guided excursion of Palermo with city restaurant lunch included. With its central location in the Mediterranean the city has a long and colourful history. Its various rulers, the Phoenicians, the Carthaginians, the Greeks, the Romans, and the Saracen Arabs have all left an influence making this bustling city what it is today. According to legend Bacchus was the god who brought wine to Sicily, legend aside, there is evidence that wine has been made here for millennia. In the more recent past most of Sicily’s grape harvest was exported to wine producers in other parts of Italy but in the last twenty years there have been major changes to the island’s wine culture and a new generation of local producers are now consistently winning international acclaim. Today we visit one of Sicily’s wineries for a tour and tasting of some of the excellent wines the country now produces. A free day before we have our ‘Farewell Dinner’ this evening and a chance to recall the many places and experiences we have encountered throughout the tour. Upon departing our ferry this evening our tour comes to an end. You may make your own way back to the UK or if our Tour Directors are returning to the UK you may travel back with them (campsite and any other fees not included from this point).